RIALTO 3, SAN GORGONIO 0 >> Tatiana Russell had 10 kills for the Spartans (3-6, 0-1) in the loss to the Knights, 25-17, 25-16, 25-16. Evelyn Soto contributed to the Spartans with eight assists while Cynthia Acosta had 10 digs. San Gorgonio will play at 4:30 p.m. Tuesday against Rim of the World. Ontario Christian 3, Loma Linda Academy 2 >> Madison Field had 20 hills and four digs for the Roadrunners in the Ambassador League loss to the Knights. AQUINAS 9 (80), LINFIELD CHRISTIAN 9 (72) >> Caroline Brown and Natascha Pirkovic each recorded sweeps in singles play for the Falcons (9-1, 5-0) in Ambassador League play over the Lions. I just spoke with the new Aquinas girls volleyball coach, Victoria Cachapero. I didn’t know until recently that former coaches Sara Rice and Jessica Granados left the school to coach at Beaumont. Cachapero is a Redlands High grad who in recent years coached at Eisenhower and Grand Terrace. She told me that the team is currently displaced as the gym undergoes renovations. The team plays on the road to start the season and won’t be back in the until “early October” according to athletic director Chris Ybarra. The Falcons have been having to practice at other gyms, including Loma Linda Academy, to prepare for the season. “It’s going to be much more modern with team rooms,: Ybarra said. Ybarra said there will be an expansion of the gym later this year. They won’t be at home until October, so the volleyball team’s Ambassador League schedule will be backloaded with home games. It will be interesting to see how that affects Aquinas in the playoff race. Last year, Aquinas finished second behind Woodcrest Christian, and just ahead of Loma Linda Academy. LLA is No. 6 in my preseason poll, while Aquinas is unranked. Aquinas could find its way into the top 10, led by sejnior MBs Indira Page and Michaella Elad and senior OH Kristen Goggin as well as promising freshman OH Eliana Chavira. Chino Hills High School shortstop Tannon Snow admits keeping the secret wasn’t easy. And this was a really big secret. The Washington-bound standout has been named MaxPreps National Player of the Year, meaning she’s the best player in the entire country. A representative called her a month or so ago to do the interview but the announcement didn’t come until last night. So word is out now, finally! Snow, an all-Sun selection put up just insane offensive numbers. In 32 games she hit a state-record 28 home runs and drove in a state-record 89 runs. She added 13 doubles and three triples so 44 of her 62 hits were for extra bases. She batted .573 and walked 16 times, with a slugging percentage of 1.513 and an unheard-of OPS of 2.129. Snow’s numbers made her a strong candidate but some of the other top honors from other outlets went to other players, mainly due to the Huskies only getting to the CIF-SS quarterfinals. “Our team didn’t go as far so I thought maybe those other players had the edge,” she said. There are still more impressive numbers for Snow: in 21 games, she had two or more base hits. She drove in a teammate in 27 of Chino Hills 32 games and in 22 of the games she drove home more than two. Snow homered in 19 games and had eight multi-homer games. Twice during the season, she homered in five or more games in a row. She hit three home runs and drove in seven runs in one game. In addition to new state single-season records for homers and RBI, Snow set state career records with 60 home runs and 212 RBIs and set a CIF-SS record for 21 doubles in a season. The other locals also earned first-team honors with strong seasons. Among the other players who landed on first team, earning All-American honors were pitcher Brooke Bolinger of Yucaipa, The Sun’s Player of the Year, and Taylor McQuillan of Mission Viejo, whose teams met in the CIF Division 2 title game. Bolinger led Yucaipa to a 31-3 record and the Southern Section Division 2 title, beating undefeated and then-No. 1 Mission Viejo, 1-0. She had 306 strikeouts with a 0.26 ERA and limited opponents to a .088 batting average. She will attend University of Nevada. Paige Halstead of Los Osos was named first team All-American at catcher. The USA Junior National Team member batted .568, scored 38 times and had 36 RBIs. She has signed with UCLA. Zoe Casas of Aquinas is the fourth San Bernardino County player making the first-team. 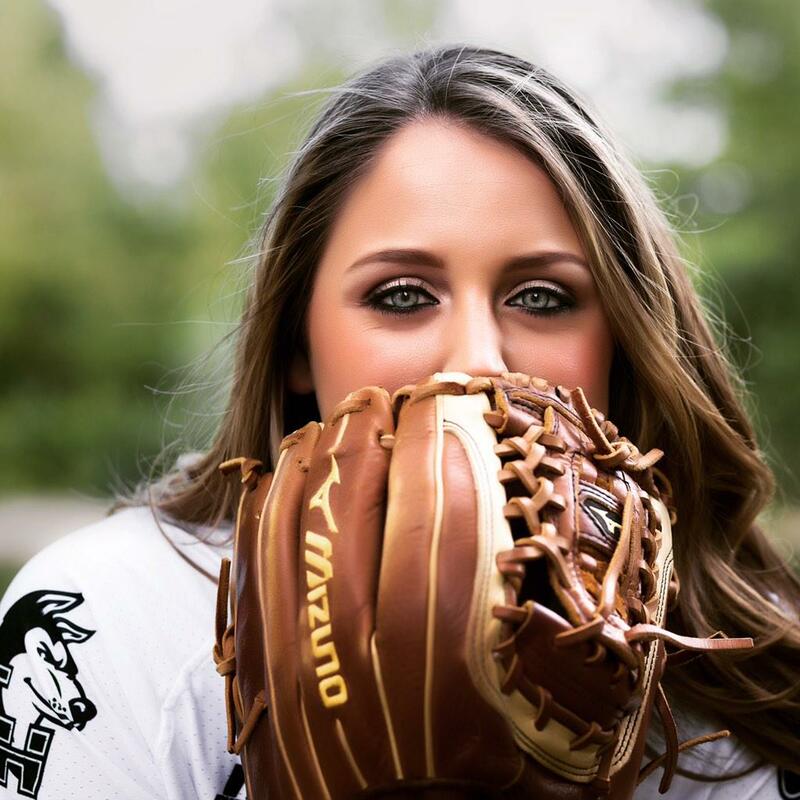 The Florida State-committed senior batted .736 with 64 hits, giving her a state record 251 base hits. In 105 games, she scored 193 runs and struck out just three times. For her four seasons at Aquinas, she batted .681. Chris Ybarra, above, had 7 seniors play their last high school game on Thursday. It’s a tradition at Aquinas to do this after the last game of the year, the seniors hugging the underclassmen. 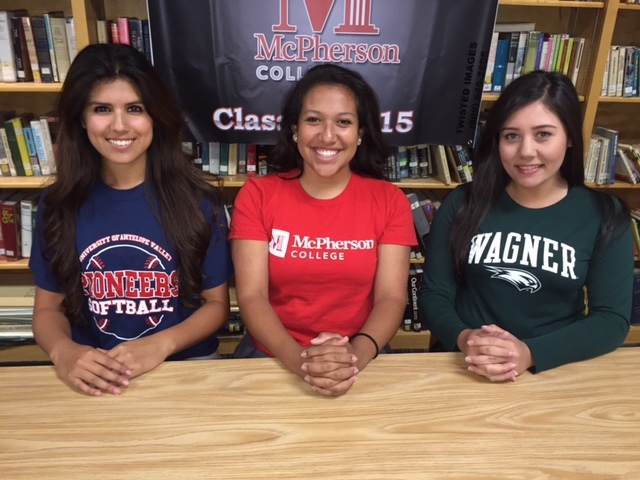 Valenzuela, Almaraz and Luna signed their National Letters of Intent recently, bringing the total to five senior Aquinas softball players signing to play in college. Zoe Casas (Florida State) and Allie Hotetz (Hampton) signed during the early signing period in the fall. “Aquinas has prepared me for this University because it is a small community and everyone gets along just like at Aquinas,” said Almaraz in a press release. Zoe Casas of Aquinas High School broke the CIF State softball record for career hits in the CIF Southern Section first round playoff victory over Palm Desert, 10-0. Casas entered the game already tied for the CIF State record, with 244 hits, but after going 3-for-4 at the plate, she stands alone with 247 career hits. Aquinas softball coach Chris Ybarra, who has been her coach for all four years in high school, stated that it is a joy to watch her whether it is during practice or a game. Ybarra stated that because it was a playoff game, the team acknowledged the efforts of Casas after the game. “After the game we handed her the game ball with the ball she broke the record with,” he stated. Casas, who is a Florida State commit, also had two singles, a double and a run batted in during the playoff victory while pitcher Allie Hotetz had a complete game 3-hitter with nine strikeouts.